On a sunny Sunday morning we went out in search of breakfast in Gisborne, struggling to find somewhere open! We found Cafe Ruba tucked at the end of the street, hiding behind a lovely tree which provides lovely protection from the sun. With a delicate tummy from being ill the night before, I was looking for something fresh to eat. 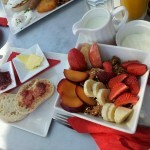 I chose the Muesli with fruit and fruit toast, which turned out to be toasted ciabatta with jam. The muesli had large bran flakes and lovely dried fruit through it, with a healthy topping of beautiful fresh strawberries, plum and banana on top, with a side of yoghurt – perfect. The Kiwi went for the cooked breakfast and got a decent plate of food with the usual suspects. All washed down with a good coffee, seated outside in the shade of the lovely tree this was a great start to our day! 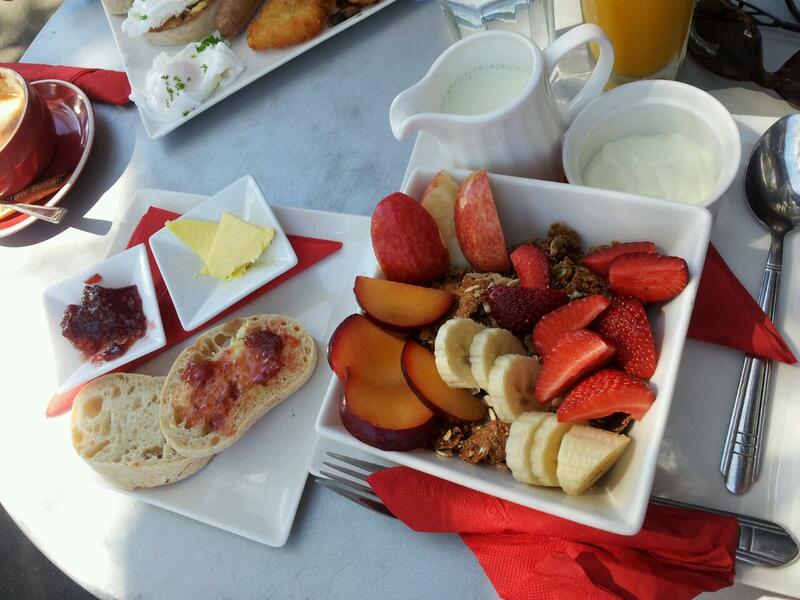 Tagged with breakfast, Cafe Ruba, Gisborne, Review.